The fall festivals look forward to the fulfillment of God’s many promises to Israel and the nations. He commands us to observe these festivals, so that we should be in awe of Him as our Judge and our Deliverer. 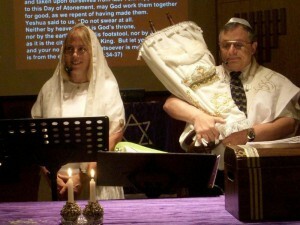 Yom Teruah is the Day of Blowing shofars (Leviticus 23:24). Traditionally, it is also known as Rosh HaShanah (New Year). 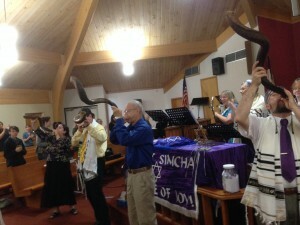 The shofars herald the coming of God as our King and Judge. As Joel 2:1 says, “Blow the shofar in Zion! Sound an alarm on my holy mountain! Let all living in the land tremble, for the Day of the LORD is coming! It’s upon us!” Rabbi Shraga Simmons comments: “The object of Rosh HaShanah is to crown God as our King. Tekia – the long, straight shofar blast-is the sound of the King’s coronation. And as 1 Thessalonians 4:1 says, “For the Lord himself will come down from heaven, with a loud command, with the voice of the archangel and with the trumpet call of God.” We blow shofars in awe and also anticipation, looking forward to the coming of Messiah, as King of Kings and Lord of Lords, to save those who have been faithful. Yom Kippur (Day of Atonement) takes after ten days of awe. The evening service opens with a solemn and emotional chant, Kol Nidre, renouncing all vain vows. On this day, we humble and deny ourselves (Leviticus 23:27), interceding with God to forgive us and all Israel, as well as all who turn to Him from the nations. We remember the Messiah Yeshua laid down His life to make atonement for us, not just for a year, but for all eternity. We pray that the day would come soon when God “will pour out . on the inhabitants of Jerusalem a spirit of grace and supplication, and.they will look on me, the one they have pierced, and they will mourn for him as one mourns for an only child” (Zechariah 12:10) and then “all Israel will be saved” (Romans 11:26). As suddenly and surely as a rainbow appearing after a thunderstorm comes the joy of the week long celebration of Sukkot (Feast of Tabernacles or Booths). It is the final harvest festival, when we are commanded to live in booths, remember that Israel lived in temporary shelters as they relied on the protection of God’s glory cloud in the wilderness, and we also consider that our own bodies are also temporary shelters as we rely on the protection of God’s Spirit in this world. We gather to build a large sukkah (booth), celebrating z’man simchateynu “the season of our joy” by waving lulav (palm branches with myrtle and willow) and etrog (a choice fruit or citron from Israel), singing, chanting a hallel of praise from Psalms 113-118, and interceding for an outpouring of rain on the land of Israel and the Ruach HaKodesh (Holy Spirit) on the people of Israel and all the nations. Immediately after Sukkot, we celebrate Shemini Atzeret (the Eighth Day, when we look forward to the Olam Haba (the World to Come) and abide in His glorious presence. Then comes Simchat Torah (the Joy of Torah), when we rejoice in processions with our Torah scrolls and roll the Torah scroll from the end of Deuteronomy back to the beginning of Genesis to start a new cycle of reading and life as a community. 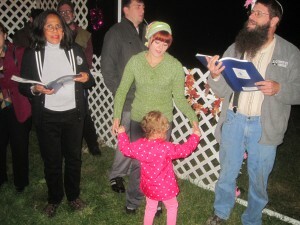 Everyone – especially including children and guests -gets to participate in rolling the scroll. Check our calendar to find out when the festivals will occur next and plan to join us! Contact us to receive email reminding you about upcoming festivals.